When Alex O’Donnell’s world falls apart, she finds it hard to imagine that a door to a new world will open. Leaving everything she knows behind, Alex moves from her Baltimore apartment to a villa in Italy where she discovers the inherited vineyard she never knew existed and a life of possibilities beyond her hopes and dreams. Arriving at the villa, Alex is taken aback by the animosity and scorn of the vineyard’s co-owner, Nicolas Giordano. Resentful of Alex’s sudden appearance, Nicolas struggles to maintain his control over his business and his feelings for his new partner. The discovery of a journal from World War II becomes the tie that binds Alex and Nicolas as they work to secure their future while putting together the pieces of a puzzle from the past. Unlock the hidden secrets within the Whispering Vines. At first glance, Amy Schisler’s Whispering Vines looked like my kind of fiction. I’m a bit of a WWII junkie and jump at anything set during the conflict. I was not familiar with Schisler or her work, but the subject matter was too tempting to ignore so I set about procuring myself a copy. Unfortunately, the novel didn’t live up to my expectations and I ended up speed reading the bulk of the second half. By the end of the first chapter I was annoyed to discover the author tells more than she shows. Schisler attempts to develop her characters by throwing a barrage of facts at her readers and I found little of note in the way of world building. I found the author's treatment exceedingly superficial and as such, couldn’t get relate to her heroine or envision the world Alex inhabited. I also found the novel formulaic, predictable, and sickeningly saccharine. I respect that some readers really enjoy this type of sugary storytelling, but I readily admit that I am not among their number. At the end of the day, I am drawn to intensity, tension, and conflict, the like of which Whispering Vines simply did not afford. Historically speaking, I wish the author had done more with the material. I appreciated the detail Schisler incorporated into the text, but I think there was room to dig deeper into the subject matter on which the narrative was based. The mystery surrounding Robbiano’s Madonna and Child was interesting and plays to curiosities regarding the methodical theft and appropriation of art by German forces during WWII, but I felt Schisler played it safe in her representations. 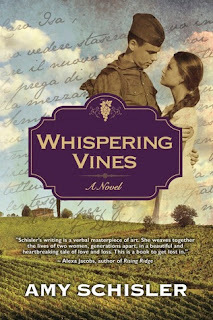 I did enjoy the details Schisler used regarding vineyards and the business of wine making and I appreciated the use of a war era journal to venture into multiple story lines, but I’m can’t say the novel rivals Teresa Neumann’s Bianca's Vineyard or Trini Amador’s Gracianna and would have a hard time recommending it to other readers.